Specialists in supplying the very best Freshwater Cultured Pearls, Honora offers an exclusive collection of fine South Sea Pearls available in classic strands as well as unique designs, in both 14k gold and sterling silver. 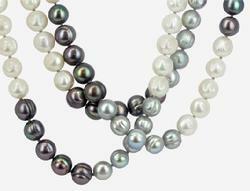 Pearls are among the most intriguing and beloved gems in the world. With Add A Pearl, pearl by pearl, you can begin a tradition. Starter necklaces are available with yellow or white gold cable chain, at any length, and you can begin with as many cultured pearls as you wish. This is the perfect was to say "I love you" to her for the rest of her life.